One of my favorite starship lines as a teenager had the humans and four alien races, and one of the alien races were Avian. 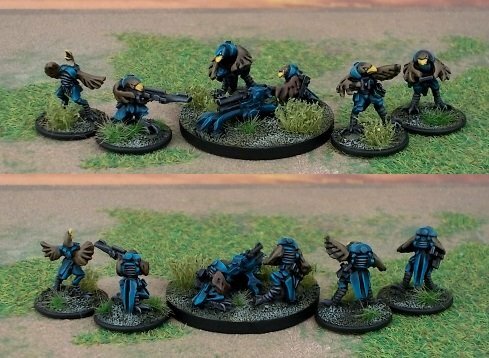 That range didn’t release infantry figurines (they did ships and tanks) and so as a salute to that I released a few codes for an Avian race called the Hauk, who are derived from raptorial birds. 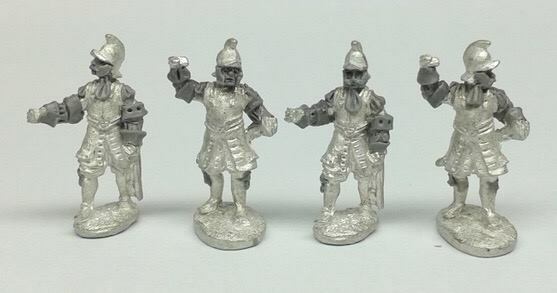 The sets proved surprisingly popular despite the small number of codes, so I decided to expand the infantry with higher level support and similar — a Weapons and Command set — which is available now. The set includes a casualty („right in the wing!“), an officer and senior NCO, a marksHauk, and two weapons platform teams, which come with enough tubes to make a battery of two plasma cannons, or RAM mortars, or one of each. I suppose you can swap them out if you magnetise the parts. 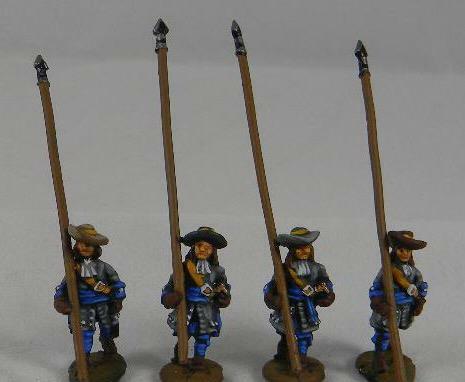 Marching unarmoured pikemen for the upcoming 1670s-80s range, painted as Dutch. Pikemen still played a vital part in infantry combat in this period, because the socket bayonet had not been adopted yet and the musketeers remained very vulnerable to cavalry attack. Pikemen could still be as much as 1/3 of an infantry formation. 1670s French armoured pikemen in their distinctive helmets …. Tolle Wurst! Aber nicht meine Setting!